Even before the start of CES 2014 (scheduled to begin mid-next week), Samsung has already started unveiling its new line of products for this year. The first one of these is Galaxy Camera 2, a successor to the original Galaxy Camera that was launched at the IFA (a consumer electronics show) in Aug 2012. The new model comes with an upgraded processor, twice the RAM and twice the internal memory. Here is a look at the specifications of the device. The camera sports a 4.8-inch HD Super Clear Touch LCD touchscreen display and is powered by an upgraded 1.6GHz quad core processor. It runs on the Android 4.3 Jelly Bean operating system and has 2GB of RAM. In terms of internal memory, this one has 8GB (user memory approximately 2.8GB), which can be further expanded an additional 64GB with a microSD card. The internal memory is also supplemented with a pre-loaded Dropbox app, an exclusive offering that provides 50GB of free cloud storage for up to two years. On the camera front, (which is what the device is all about to begin with) Galaxy Camera 2 offers a 16 MP 1/2.3" BSI CMOS sensor- with Optical Image Stabilisation- and 21x super long optical zoom, which the company claims will produce vivid images that are both rich in color and sharp in detail. The camera also comes with built-in pop-up Xenon Flash, and is capable of recording full HD (1080p) videos at 30fps, and HD (720p) videos at 60fps/30fps, among others. The camera also features a Smart Mode, which enables users to choose from 28 different pre-set modes all designed to address different shooting scenarios. These include Beauty face, Continuous shot, Color bracket, Kids shot, Action freeze, Rich tone (HDR), Panorama, and Sound&Shot, among others. Also, for those who are unsure which mode they want to select, a 'Smart Mode Suggest' feature analyses the scene at hand by recognising lighting conditions, scenery, objects, and then instantly recommends the optimal Smart Mode. The dimensions of the device are 132.5mm x 71.2mm x 19.3 mm and its weight is 283gm. The company has also provided an enhanced 2,000 mAh battery in the device. In terms of connectivity, this one offers Bluetooth 4.0, Wi-Fi, and Near Field Communication, but no 3G/4G like its predecessor. Tag & Go: Makes it easy to connect the Galaxy Camera 2 to NFC-enabled smartphones and devices. All it takes is a tap of the smartphone and camera and devices will be automatically paired and transfer images. Photo Beam: The picture being viewed on the camera is automatically sent to the paired smartphone, while 'Mobile Link' allows photographers to select images they wish to transfer to their smartphone at their leisure. Remote Viewfinder: Lets photographers' control the camera using the smartphone, providing greater freedom for setting up and snapping shots. Smart Mode selfie alarm: Guarantees that self-portraits receive the attention they deserve. It takes five consecutive, high resolution images so that users can select their best angle and share immediately on their favorite social media site. Multi Motion Video: Allows users to set the speed of capture and create speed up or slowed down movies. Ranging from eight times slower than normal speed up to eight times faster, this feature adds visual flair to footage. The Galaxy Camera 2 also makes it easy for photographers to use their favourite applications, such as Paper Artist and Xtremera, to personalise their shots straight from the camera. 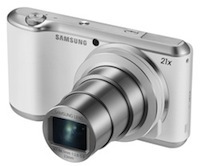 Read here for detailed specifications of the original Galaxy Camera. While details on pricing and availability for India is not available as of now, we expect to know more on the same during the CES 2014 event. In addition to the Galaxy Camera, Samsung has also launched a number of other photography-first devices that include Galaxy NX camera - with interchangeable lenses, 3G/4G connectivity and Android Jelly Bean; and Galaxy S4 Zoom - sports a 4.3 inch qHD Super AMOLED capacitive touchscreen display, 16 megapixel autofocus rear camera with Xenon Flash, and 8 GB of internal storage. You can read about both of them here and here.